As promised Apple have released a new version of watchOS supporting their new ECG feature. Currently the ECG app is only available in United States, Puerto Rico, Guam, and the U.S. Virgin Islands. May already have saved lives! A user on reddit have an interesting story to tell. He was going to try out the new app and the results came back as AFib. Thinking this was only a glitch he tried several times, and on both arms. Still AFib. When his wife woke up he tried on her arm, thinking the watch had an error somehow. Her readings came back Normal. So he went to the doctor to get it checked by professionals and sure enough AFib was the results there as well. Doctor telling him this may have saved his life. This is not the only story about Apple Watch contributing to saving lives. Just make sure to not blindly trust the technology, but go to the doctor if you get irregular readings from your watch. Mac Role Playing Games: Divinity: Original Sin 2 is Coming! 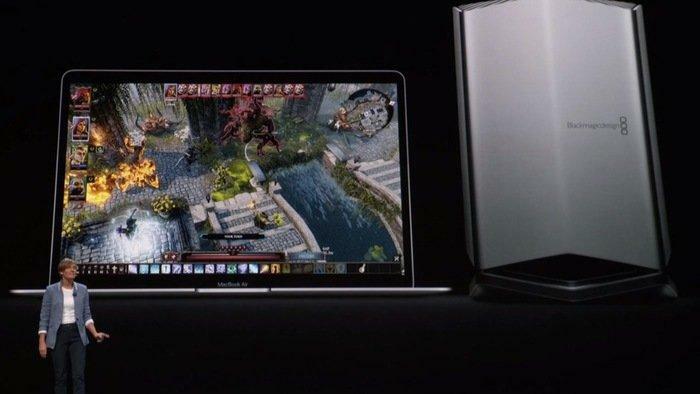 If you watched the Apple event where they released new Macs and iPad Pros they also had a section showing the critically acclaimed role playing game Divinity: Original Sin 2. It turns out the game is on its way to the Mac and not in a small way. This will not be a poorly and sloppy port, It will take advantage of many Apple technologies such as making it a 64-bit, Metal native game. Just check out this spec list. Divinity: Original Sin 2 have sold over 2 million copies. Its one of the most highly rated role playing games and could easily be the best RPG on the Mac. Apples Metal Team is working with the developer to bring this game to the Mac. Planned release is Q1 2019. The game will support iCloud backups, but not only that you will be able to cross-play between Windows and macOS. You should check out a game called Torchlight. It’s an action RPG game developed by people who previously have worked on Diablo, Diablo II, Mythos etc. The music is composed by the original author that made the music for Diablo. Somewhat cartoonish graphics but it works, and the game isn’t so demanding for your computer. You don’t need the most high-end gaming rig to play this game. I have played the game and it is pretty nice. You can download it from the Steam client. Torchlight 2 is also out. Eschalon is an old-school style fantasy RPG. The game-play perspective is in third person. You guide your character around towns and dungeons. Fighting monsters and picking up treasures while all other elements of a good old RPG are there. Many reviewers give this game high ratings. This is not an old game, it is just developed in that particular style. Who doesn’t know about this game? Diablo 3 is available through battle.net. You can watch a video below where I test it on a MacBook Pro 2016 w/ Radeon Pro 455 in (2560 x 1440). My absolute favourite app for macOS has to be Magnet. Its a window manager for macOS that works in a lot of similar ways to the native Windows manager. Drag a window to the right or left of your screen and it resizes the application in half. Making room for an application next to it. Or drag the window to the top, to maximize it. It is a great way of keeping the workspace organized. Its a cheap application and you can get it from the app store in macOS. Another great way of getting new apps to your mac is by using the service Setapp. They often add new applications to their constant growing catalog. This way you are getting more value for your money with time. Setapp is an subscription service ($9.99 /mo) that gives you access to a huge list of well known apps. A free 7-day trial is available so you can check it out without paying anything. 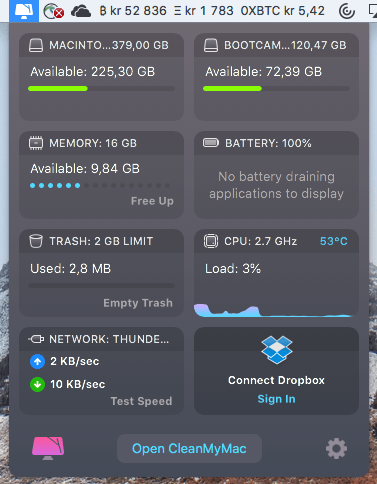 iStat Menus: An Advanced System Monitor for Your Menubar – Shows me vital system information about my system like CPU temperature, network traffic, free memory and storage to name a few. Flume: A Beautiful Instagram Experience for Your Desktop – I use Instagram for growing my artist profile (I also produce music and photos). 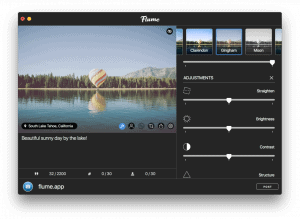 Flume makes it easy posting to Instagram from a desktop environment. BetterTouchTool: Customize input on your Mac! – BetterTouchTool makes the touchbar on the Mac laptops actually usable. You can for example have live update of your cryptocurrency price (if you are into that). These are apps I actually like and use myself. Check out SetApp: Your Shortcut To Prime Apps For Mac. to see for yourself and try out their 7-day free trial. What are your favourite apps for macOS? macOS Mojave is right around the corner and before you update its a good idea to clean your system. I have used computers for a long time so I have experience in keeping my systems up and running without issues. To my surprise, CleanMyMac X found a lot of data (26GB!) to clean & remove from my MacBook Pro. 26GB in data stored on your Macs super fast SSD is a lot of money, considering how expensive storage is on Macs nowadays. Cleaners like this has in the past had some bad rep, but CleanMyMacX is not one of them! The developer: MacPaw makes other applications like Setapp, Gemini and other known highly rated applications. 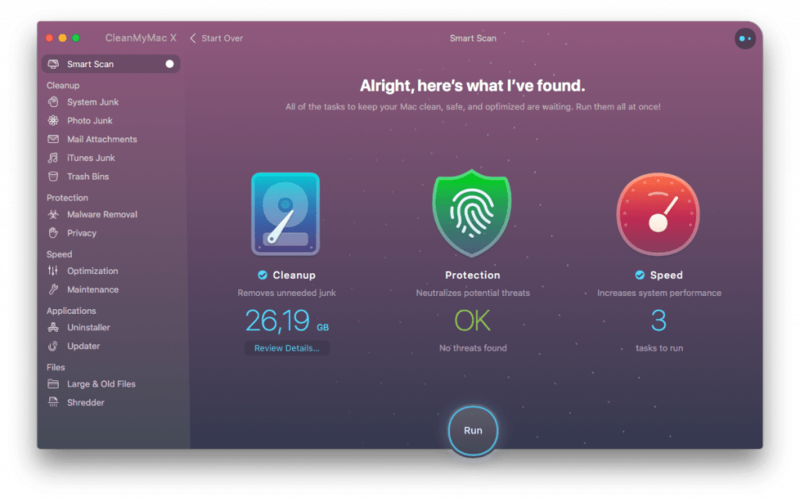 Using this software is a very simple way of keeping your Mac clean. As you will see in the screenshots below. As you can see in the images above it found a lot of data lying around that isn’t needed. Data such as system logs, user cache, old updates etc. While you absolutely could go into these folders yourself and delete the files its convenient to have an application that does this for you. You could also drill down into the folders to see exactly what the software removes so you have full control. 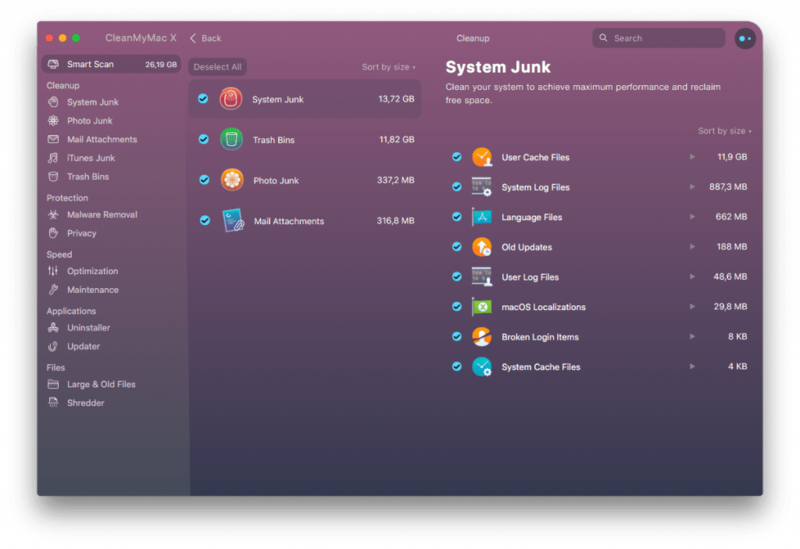 CleanMyMacX have an improved algorithm for finding junk that doesn’t need to be on your Mac. Saving you precious time. MacPaw have created a reliable Safety Database that prevents cleaning mishaps and carefully treats all user data. CleanMyMac doesn’t delete any of your personal files or useful app data unless you want it. I have been using Clean My Mac for a few years now and it has never done anything bad to my system. The screenshots above are true screenshots from my own system and I have used the computer for a week after running the cleaning it and it still works as good. No issues, no slowdown, no bloat. Other than cleaning your Mac it has a Malware scanner that checks for malware and adware. It can also check and update apps installed outside of the Mac App Store. One thing I really liked is the updated menu bar where you see information about your system such as available storage (even on the bootcamp drive!). Available memory that you can free up with a click. CPU load, network usage and battery status. You can also see your dropbox usage there if you have it. I don’t, I use google drive and iCloud. As I said earlier, you could go into all these folders and delete files yourself. However you have to have knowledge about your system and you have to know exactly what to remove. If you use CleanMyMacX you don’t have to worry about that. I recommend this software. I never really thought I would use something like this myself but clearly its a time saver so for me its worth it. The retail price is about $90 for a one-time purchase or $40 per year for a subscription. Its a bit pricey perhaps, but it does a good job. And again, do not confuse CleanMyMac X with other bad cleaners out there. If you want one, this is the one to get. Apple have received some criticism due to slowdowns on older iPhones. When the battery can’t keep the charge anymore, the CPU is clocked down to prevent unexpected shutdowns. Pair this with new iOS releases that allegedly slows down older devices. A slower CPU clock reduce the performance of the device and it may seem more sluggish and slow to use. This is why apple released the iPhone battery replacement program where you get the battery replaced for $29 for eligible devices through December 31, 2018. With all of the above said, testing reports of iOS 12 claims it performs very well on older devices. The interface feels more fluid, and most of the lag you could feel in older iOS versions are gone. This is great news for people that use devices a few years old. If money is tight, a cheap battery replacement combined with iOS 12 should breathe some new life into your device. This is really good news economical wise and I am sure Apple will get some positive PR score on this. I decided to do some un-scientific test between the latest iOS 11, and iOS 12 to see how much faster it feels on the oldest supported device. My trusty iPhone 5s was fished up from the drawer, charged to 100% and got to do some work again. We can clearly see that iOS 12 scores better. The interface overall feels more responsive compared to iOS 11. The keyboard pops up faster, the camera starts faster, apps load a little faster and most things generally feels snappy. The iPhone 5s felt usable again and not that laggy compared to before. The benchmarks above also show that it is faster. In addition to the results above I am currently using an iPhone 6s as my daily driver until the Xs Max arrives and I must say it really feels like a new phone again. Apple have done something this time and it certainly shows. If you haven’t already, go and update to iOS 12 now! 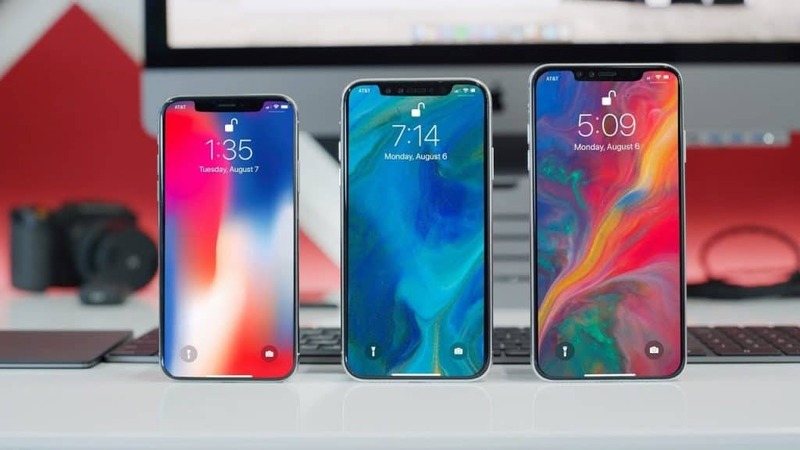 In a video we see the 2019 models of iPhone X Apple is planning to release at the end of this summer. Apple usually refresh their iPhones each year around this time. Marques Brownlee who is better known by his youtube handle: MKBHD just released a new video where he shows off three different models at different sizes. The biggest device sports a 6.5 Inch OLED display. A bigger version of the current iPhone X. Do you think Apple will slap a Plus behind the name? Or will they call it iPhone 11, 9? Xs? Black, white and a new gold color will be available to choose from. Everything is a rumor though, and we can’t be sure until september when Apple have its event. I will try to be as un-biased as possible in this article, but I will still share my own opinion about the mac vs windows issue. The never ending debate, what system is best to use for music production or creative production? Depending on who you are asking you will get different answers. The simplest answer is, buy the system you are most comfortable with, and the system that works with your DAW. However the answer isn’t always that simple, and I will try to outline some of the differences between both systems so you can make your own decision on what to choose. If you want to use logic, you don’t have a choice, a Mac is the way to go for you. Other DAWs however, like Pro Tools, Ableton Live, Cubase, Reason, Bitwig and now even FL Studio is multi platform. This means you can use it on Windows, or macOS. They work on both systems. You may have been told that Macs are best for music production. I don’t have any scientific numbers to back that claim up. But it is true that at least in the 90-ies Macs mostly occupied music studios around the world. They still do today in professional studios. This article however, is not really for you that works in a professional music studio. You already know what tools you have to use to get your invoices paid. This article is more geared towards the hobby producer. Or semi-professional. Why choose chose a Mac? As I mentioned earlier, if you want to use Logic you have to get a Mac. You also have Garageband which is free. Its a stripped down version of Logic. Any GarageBand project you make can be opened in Logic if you decide to upgrade later on. If you buy a Mac, you have everything you need to start up with music production right out the box. You don’t have to buy any software in addition to that to get started. Macs have often been the computer of choice in creative industries, and they are known for its stability and ease of use. If you need to work with others it is a high probability that they use a Mac as well. When you get a Mac most of the system is ready to go from the box. You may have to install some plugins yourself and connect an audio interface. Most of the time this process is painless and you are ready to go fast. Macs are generally more expensive than its PC counterpart, but with a Mac you get the complete package with quality materials and excellent build quality. Many people agree that this is worth paying extra for. macOS is considered to be a stable and excellent operating system. It is perfect for audio work with its stable and proven Core Audio system. Macs also tend to get less viruses and malware, although it exist but its much less of a problem compared to Windows. If ease of use, a stable OS, painless connectivity and build quality is important for you. A Mac may be the way to go if your budget allows it. A PC is cheaper, you get more raw performance out of your system for less money spent. A PC is upgradeable, a Mac nowadays isn’t. A few years ago, you could buy a lower specced Mac and upgrade some of its parts later on. This saved you some upfront costs. You could upgrade the RAM, or when your hard drive filled up with time it was possible to replace it with a bigger one. Or an SSD. Nowadays when you buy a Mac, you have to get the correct specifications when you order it, its more or less impossible to upgrade it afterwards. Although todays Macs look good, have excellent build quality, and it feels like a tank. Its impossible to upgrade them. Everything is soldered on the motherboards, even the hard drive / SSD, and memory. With a PC, you can start out cheap and add or upgrade the hardware later down the line. You don’t have to go out and buy a completely new system from scratch to upgrade your RAM, hard-drive, CPU, display, etc. With a PC you can decide for yourself whats more important for you. Do you want to game on your system during some downtime? Great, get a decent GPU and gaming is very much possible. Doing this, may require that you know a thing or two about computers. But building your own computer isn’t that hard and nowadays there are plenty of youtube videos of PC building for beginners. I use a Windows PC for most of my production. The biggest reason for this is because I need the raw CPU power for many of my projects. Many projects use a lot of soft-synths, which are CPU heavy with their unison / detune. Getting a Mac with a good CPU is possible, but its extremely expensive and I can’t justify the costs of that right now. Also I do some occasional gaming and its just better to play World of Warcraft on a PC. I also record videos of music production, doing screen recording and playing back a project in real time on a Mac would require me to buy a highly specced out system and thats economical suicide for me at the moment. I need to be able to swap out my hard drive when it fills up without having to buy a new computer, or hang a dongle on the outside of my computer. I want to be able to upgrade my memory without having to replace the entire motherboard. At some time, I may want to use Macs again for music production. Mostly because I like their os and ecosystem. But how the roadmap looks like now. It just isn’t possible for me. In closing: I cant tell you what to buy. Thats a decision you have to do yourself. I hope this article helped you in some way and good luck with your music production! Apple have released an important update to macOS which is designed to fix the reported throttling issues uncovered on the new 2018 MacBook Pros. When the machines was set to do heavy workloads the CPU would clock itself down (called: throttling). The fix is delivered through the App Store as an supplemental update to macOS High Sierra 10.13.6. Many media publications, and you tubers have re-done their tests with mostly positive results. The results are significantly better compared to earlier reviews and it seems like Apple have fixed the issue. MacBook Pro 2018 “Throtthlegate” may be Blown Up? One thing for sure is that the last thing isn’t said about this MacBook Pro throtthlegate. Something I find interesting is that the testing tool (Intel Power Gadget) is removed from Intels website (as of this writing). Many youtubers use Intel Power Gadget to test the MacBook Pro. I am not sure why Intel removed it, but I suspect it could be that it doesn’t support the new CPUs correctly. Still, the cooling solution in todays MacBooks are far from good in my opinion, but it is what it is. So to continue the discussion another known youtuber Jonathan Morrison is doing his own extensive tests and shares it in a well researched video. Some of the things he talks about is that Premiere Pro isn’t really optimized yet. In short, the i9 beats the i7 in the tests he does. The numbers above are just some of the results he got from extensive testing. Make sure to check out the entire video below and definitely subscribe to his youtube channel if you are interested in Apple related content. As you probably are if you are reading this. In my opinion I would like a better cooling solution on these machines, I don’t mind it to be a little heavier if it mens that the performance can be sustained for a longer period of time. With that said I think Apple have their reasons for doing what they do, and its not always clear from the beginning. A lot of people like to hate on Apple and in some cases it is certainly justified, but I don’t think the last thing is said about this MacBook Pro throttlegate yet. Reports are coming in that the new MacBook Pro released in 2018 suffers from some bad thermal throttling. Especially the model with the upgraded i9 CPU. If this is a design flaw, an actual problem with the unit is yet to be uncovered. We can hope, that this is just an error and will be fixed by repairing or replacing the product. With Apples history of engineering their products right within the CPUs maximum junction temperature I don’t think this is the case. I think the device in the video below is working within spec. We are just using it wrong. Apple have put a beast of a CPU in this device, but this YouTuber claims that Apple wastes all that CPUs potential because of the limited cooling the 2018 MacBook Pro has. Mostly due to their thin form-factor. You can’t engineer away the laws of physics. If you put the Mac in a freezer so it keeps cold, the full performance and potential unlocks. A new article from Appleinsider – Thermal conditions in the 2018 i9 MacBook Pro dramatically hampering performance also confirms this issue, where they get similar results. What do you think, is this thermal throttling computer a good choice for professional use? Is it acceptable to pay a lot of money and not get the performance you paid for? Maybe this is just an error and Apple will fix it? (I don’t think so). A lot of people have cancelled their orders. I wouldn’t recommend this laptop if these issues don’t get fixed.